The University Library is a teaching organization that collaborates with faculty to prepare students for life-long learning as informed global citizens. Welcome to the Washington and Lee University Library. The University Library supports Washington and Lee’s central mission of teaching, learning, and research in the liberal arts by providing a wide range of materials in all formats for use in the classroom, in student learning, in faculty research and preparation for teaching, and by offering a highly skilled staff to assist faculty, students, and other users in their knowledge inquiries. In addition to more than 650,000 volumes housed onsite, the library’s website provides convenient access to resources on the World Wide Web. The Special Collections and Archives Department includes rare books and manuscripts and the university archives, with a collection emphasis on the history of the university and Rockbridge County, Generals Lee and Washington, and the Shenandoah Valley. The University Library is truly without walls and, when it comes to providing information, is increasingly free of time constraints as well. Through the Internet, students and faculty both on and off campus have 24-hour access to the library’s web site and all of our electronic resources. Our participation in a strong resource-sharing system allows us to obtain needed materials from other libraries all over the nation. The University Library’s two buildings, the James Graham Leyburn Library and the Robert Lee Telford Science Library, are open 24 hours daily when classes are in session, provide wireless Internet access throughout, and serve as the university’s primary venue for study, research, and work with multimedia resources. The separately administered Wilbur C. Hall Law Library serves the Law School. Former reference librarian Betty Kondayan covers the period 1776 through 1937 in her excellent booklet, A Historical Sketch of the Library of Washington and Lee University. And in 2009, after using his internship at the University Library to research the library’s more recent history, Corey Harmon wrote a paper, A Brief History of the Washington and Lee University Library, 1938-2003, for the University of North Carolina at Chapel Hill’s Master’s degree in Library Science. He includes a brief summary of highlights from 2004-2009 at the end of this paper. For the first three-quarters of the 20th century, the W&L library was located in the current Commerce School, then called the Cyrus Hall McCormick Library. In the 1960s it became clear that our library resources were outgrowing the building, and that the university had to plan for a new library building. “The new undergraduate library will be –as the library at a good college must be– the hub of the campus, both academically and physically.” (Alumni Magazine 51, no. 6 (1976): 7). The Richmond architectural firm Marcellus, Cox & Wright designed a 130,000 square foot building, four times the size of McCormick Library. One day in January 1979, the library, under the direction of then university librarian Maurice Leach, organized the “Great Move”, during which volunteers walked over the entire book collection to the new facility, carrying them in shopping bags donated by the Leggett department store in town. For the first 15 years, the building was simply called the University Library. 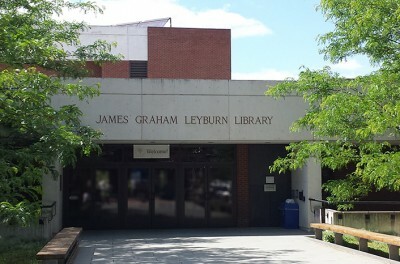 On May 28, 1994, the main library building was named in memory of James Graham Leyburn (1902-1993). During the celebration, university librarian Barbara J. Brown addressed a large audience, among which were many Leyburn relatives. A portrait of James Leyburn was revealed. This portrait is currently hanging by the entrance of Northen Auditorium. James G. Leyburn was a distinguished teacher, scholar, administrator, churchman, author, and mentor to generations of students at Washington and Lee University. A graduate of Trinity College (Duke), Princeton, and Yale Universities, Dr. Leyburn came to W&L from Yale in 1947 as Dean of the University. As dean, he led the university to national prominence. In 1956 he turned to full-time teaching as head of the department of sociology. He taught with legendary energy and passion until his retirement in 1972. The painting above is the 2004 portrait of James G. Leyburn by New York City portrait artist Steven Polson. It can be viewed in the main lobby of the library. The Telford Science Library is located immediately inside the Science Addition, which is next door to Leyburn Library. You will enter on Level 3, which is the main floor.